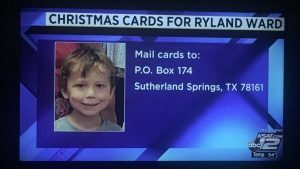 A young survivor of the Sutherland Springs shooting is hoping to get some Christmas cheer while still recovering in the hospital. But Ward also turns her attention to her two grandchildren, Rianna and Ryland, who survived. Ryland is still recovering in the hospital. “They still haven’t told him yet that his mom and sisters are dead, but I’m sure he’s kind of getting some kind of idea because he’s 5,” she said. Ward said despite everything, Ryland is always smiling.